Last night a friend invited me to the 35th Festival International du Cirque in Monte Carlo - and it was fabulous! 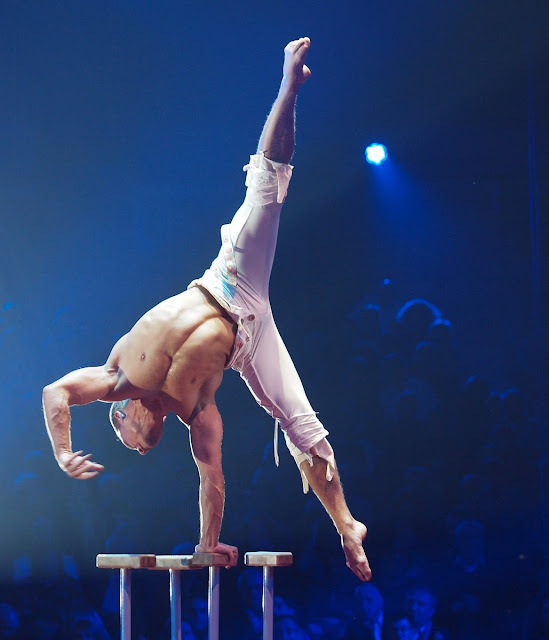 This is Roman Kapersky, a Russian 'equilibriste' who was, as you see, pretty amazing. The prestigious awards given at the festival are called Clowns. There is the Bronze Clown, the Silver Clown and the Gold Clown. Roman was a delighted recipient of the Bronze Clown presented to him by Pauline Ducret, the eldest daughter of Princess Stephanie of Monaco who is the President of the Festival. That must have been so fantastic to actually BE there!! Must have been fun to watch. C'est Magnifique it must have been a stunning performance. He seems to be quite an athlete and performer! I marvel at how you took that photo - ISO setting, etc.?? Your shot is amazing as well. Look at how fit he is! Amazing. Leif, the ISO was 800 and I put the camera on the Sports setting so it shot fast. White Balance was on the Lightbulb!